Over the past few weeks, we had the pleasure to host Brazilian artist Mateus Bailon – together with some of his incredible bird creatures. Bailon was born in Santa Catarina, surrounded by the Atlantic Ocean and Forest. Inspired and fueled by this amazing biodiversity, he travels the world in order to spread and empower the nature he grew up with. Bailon paints fantastic animals – heralds of his own mythological universe. Some of these creatures have also emerged in the course of his residency at Rabbit Eye Movement – and we are happy to inform you that they stayed here with us. 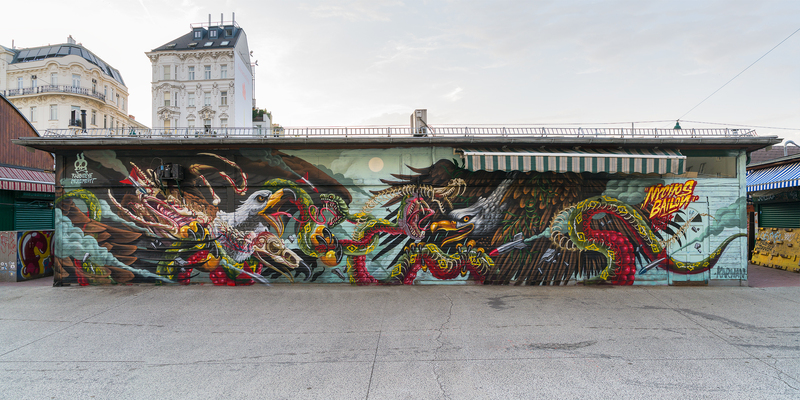 “Earth, Wind and Fire” is a collaboration between Mateus Bailon and Nychos, located at the “Wiener Naschmarkt”. The Naschmarkt is Vienna’s most famous marketplace, highly appreciated for the food, the flair – and the appearance when the market stalls are shut down. Most of their walls and shutters are painted and only visible, when all the furniture is stowed away. Some of them occur legally, others not so legally. Although the mural was approved beforehand, the city wanted the fresh piece to be overpainted only a few days after Nychos and Bailon had finished their work. The cause: The mural breaks with the tradition of standardized green market stalls. Well. Thanks to Nuriel Molcho (NENI) the piece is still there. We hope it remains. 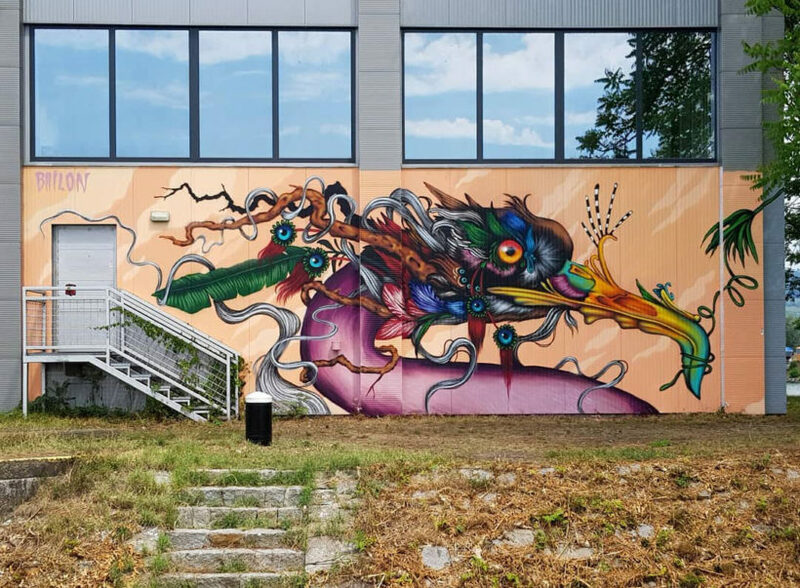 “The growing branches in my mind are not strong enough to hold me down.” – Bailon’s second mural – is located at the Mural Harbor in Linz, a constantly growing open-air museum for Urban Art and Muralism. Pay the bird and the harbor a visit. We promise, it’s worth it. But Mateus Bailon did not only work outdoors, he also spent a good amount of hours in the deepest depths of our burrow. As we’ve already mentioned before, he left behind some of his fantastic bird creatures. We are currently taking care of them until we find an appropriate date to introduce them to you. In other words: Stay tuned, there’s going to be an exhibition later this year. Huge thanks Mateus for visiting, we had such a blast. Take care on your journeys and see you soon. Hongwei Tang for making the pic.